Since no lecture was given in March 1974, subscribers received instead excerpts from two lectures given in December 1973 at the Center—one on Christmas Eve, and the other on the occasion of the inauguration of the “Hangout,” a large room for the children, in which they could play, work, listen to music and be by themselves. Every one of you here is able, at this point, to create your life anew, to set a new direction from within. Much of this is already happening to many of you, as you are well aware, and more can happen. At this time, in your realm of consciousness, you celebrate a symbolic event. You celebrate the Christ-consciousness, or the divine consciousness deep within your own being. Most human beings live a lifetime—nay, many lifetimes—without ever knowing that there is something within that surpasses the ordinary consciousness. This extraordinary consciousness, the sublime consciousness, must be awakened within the course of the evolutionary journey of each entity. Here, on this path, you are learning to eliminate the obstructions and the obstacles. At this particular time, when the birth of the Christ consciousness is celebrated, we shall talk about the event as it begins to take place. Of course, my dearest friends, you do know that this does not happen at once. It happens gradually, again and again. It occurs, is lost, recurs, and so on. Perhaps you can see the tree that you light as a symbol: many, many candles have to be lit and be aflame within you to bring the total consciousness to its eternal glow on the outer level of your manifest existence. Each recognition, each insight, each honest admission, each shedding of a partial mask, each breaking through of a defense, each step of courage and honesty where you take responsibility for your negativity, is a lighting of yet another candle. 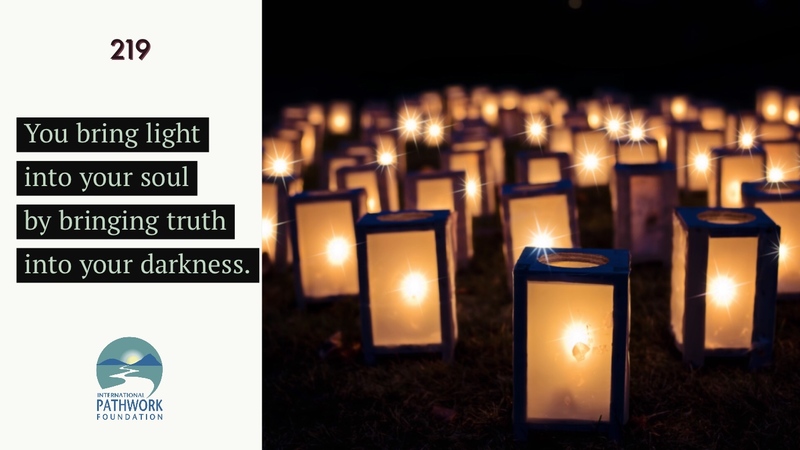 You bring light into your soul by bringing truth into your darkness. But as long as you project your darkness outward, in order not to face your own shadows, you cannot light the candles. The great lighting of the whole “tree”—the tree of life—is an ongoing process. And the more candles are lit, the greater the joyousness and the glory become. With great joy we observe how much more of this glory and this joy you, my dearest friends, are now being able to activate and to stand! These are not empty words, my friends. You who work on this path know how arduous it is to take the emphasis away from the outside and turn it on yourself: to change from blaming and resenting to seeing your own hatred, your own enviousness, your own greed and your fear of recognizing it. Now let us specifically talk about the need for self-acceptance. Again and again you lose sight of its importance and you get stuck in your self-hate, which then makes you put the blame on someone or something else. This is the danger. The more you hate yourself, the more you put your hatred onto others, because self-acceptance seems too final a judgment, too self-annihilating. And the more you project it outward, the more you lose your grip on truth and reality and the more you hate yourself. Can you, at this time of commemorating the birth of your eternal Christ child within, commit yourself to accepting every part of you? In this message I want to convey to you that there is nothing whatever that need be rejected, nothing whatever you cannot accept and forgive. The only thing that is truly destructive and makes you lose your bearing is not accepting and forgiving and therefore acting out. In every negative quality a positive one is embedded. I said this often, but mostly only in general terms. The negative traits are nothing but distortions of positive divine expressions. Perhaps you can all begin, at this particular time, to take the mental step to opening yourself to the possibility that there is love and understanding where you now hate and judge. In your hatred you are in darkness. In your denial of the hatred you are in a much bleaker darkness, much further away from the light. You then become hopeless because you no longer know where you are. But step by step you find your way back. You admit your hatred, and it is no longer quite so dark. You light a candle with this truthful admission. And as you accept the infantile egocentricity within you, you light another candle. For by accepting it, you will come to know that the infant can grow. Only in the acceptance of the infantile egocentricity can you find the birth of the Christ within, of the eternal consciousness that contains all there is. True strength, true creativity, true love, true security, all these are candles that spring aglow from your honesty, your courage, your truthfulness, and from the faith you cultivate, little by little, that makes you overcome your fear to go all the way with yourself, to go through the fear and keep the possibility open that there is no abyss. There are only tunnels, many tunnels, to go through. Going through tunnels brings more light, until finally, as in the symbol of the Christmas tree, the lights converge into one point. In that one point is All—all there ever need be. It is the creative nucleus from which you can create life, circumstances, love and rich fulfillment. When you no longer turn away from the darkness within you, realistic hope will grow where now there seems to be no hope. Much of this is already happening with you, my friends, and these words are given as encouragement to continue on your beautiful path. Perhaps, at this opportunity, it will be very helpful if we work on particular traits and aspects that you present to me, so that I will show their positive, beautiful essence. In that way you will learn that there is nothing in you that is in itself rejectable and unacceptable. There is only distortion. No matter how negative, destructive, evil, dark, bad something may be, it is but a distortion of something beautiful. Even you, my friends, who have been working on this path for some time and profoundly so, forget this truth, or do not know how to apply it. You cannot quite make the specific connection. For that purpose it will be very beneficial if you present me with some traits in which you can see only the distorted, bad manifestation and not the original, beautiful essence. In understanding the specific, positive, original components, you will find new strength and impetus to go through the smaller and bigger tunnels on your path and light more candles. QUESTION: I judge others all the time. What is the positive original component in that? ANSWER: Apart from the obvious projection of your very harsh judgment against yourself that you do not wish to acknowledge to the extent it exists, the original positive quality in being judgmental is a great capacity to distinguish, to differentiate. It is the power to recognize, to be one-pointedly aware. If you use this ability creatively and constructively, it is obviously a wonderful asset without which a person would be incomplete. So, you see, nothing as such must be “thrown out,” destroyed, negated. It must be transmuted. You all notice on this path that the more honestly and constructively you see the truth in yourself, the keener your perception of others become, but in a very different way from the judgmental attitude you mentioned. Use this asset on yourself and others, but not with the kind of hostility and negation you now practice still too often. The truth must prevail with forgiveness and understanding, with a readiness to understand deeper connections so as not to judge in an ultimate and rejecting way. Transform negative judgement into recognition. ANSWER: Defiance, spite, stubbornness, rigidity are all derivatives of the same blockage. Their positive, original seed is the quality of being centered within, being firm, self-assertive, standing your own ground, being secure in your own self, rather than being constantly swayed and influenced by others and thus losing autonomy. My friends, it is very important that you recognize the positive origin behind the distortion, but, at the same time, beware of using this knowledge in order to justify, whitewash and thus perpetuate the distorted version of it. Use this knowledge, so that you do not reject and eject the whole thing. The purpose of this explanation is to teach you that there is nothing in you that is not originally divine. Learn that nothing must be denied and ejected. But the differentiation must be made between its original and its distorted version. QUESTION: I have a very strong lack of faith and do not want to believe in God. ANSWER: This is a distortion of the healthy, realistic attitude regarding self-responsibility and self-dependence, of knowing that there is no authority that will do it for you. It is a distortion of the truth that you are a self-responsible agent, which, in reality, is not, of course, in opposition to the deeper, wiser Godself the ego must surrender to. It is this divine self that alone can bring about true selfhood, autonomy, independence. You have a stake in your lack of faith and in remaining with the distortion. Whatever the nature of this stake, it must be unearthed. For whenever you have a stake in not wanting to know the truth, you shut out the light. One of the most important aspects to learn on your path is the ability to open all doors. You should be aware that you deliberately wish to keep the doors closed. Always assume that you may be mistaken, your view may be wrong, the truth may be different. After you are willing to let go of your defensiveness for the sake of truth, after you let go of the tightness and fearfulness of your opinion, you will find out whether you happened to be right about the issue in the first place. If it then turns out to be true, you will come back to the same knowledge, but in a very different way. I am not only speaking about the particular question you asked me, for God indeed exists. I speak generally about the tightness of holding on to a belief that is so often totally mistaken and distorted. Nothing makes you as unhappy as your own untruthful belief. QUESTION: What is the positive aspect of a fearful, anxious state? ANSWER: Fear, in general, is a distortion of caution, an awareness of something, somewhere, being amiss. Specifically, in the human state, anxiety is always a sign of repression. Such a state is a gauge for you that tells you that there is something you do not wish to see and that makes you anxious. So anxiety is really not even a distortion of something positive; it is positive, in the sense that it is a signpost pointing to where you wish to remain ignorant about yourself. Whenever you are in anxiety, know this clearly, for it is the truth. Set out with full commitment to the truth to find out what your denial is specifically. Go into deep meditation, preferably in the presence and with the help of friends. Throw it all in, let go of everything that you hold on to. Let the energy of the meditation of your friends also help you and then work it out together. You will find it and thus light new candles. That choice always exists. Denial of the truth of the matter is what creates anxiety. This may apply to many things. QUESTION: I have a stake in being rebellious, in going against authority and even against what I know to be the truth. What could possibly be positive in the origin of this destructiveness? ANSWER: The original aspect, before distortion sets in, is a spirit of courage and independence, a fighting spirit against submission to conformity. Only in its distorted version does it become a blindly driven, senseless destructiveness. QUESTION: What is the positive origin in my tendency to avoid taking responsibility for my life, my tendency to avoid? ANSWER: In its original, divine manifestation it is the quality of letting go and letting flow, of not letting the ego-control take over and blot out the eternal flow of being, of not being cramped and tight and overactive with the ego forces. It connotes giving in and surrendering to the flow of being. It is important that the knowledge I give you here should not be used to avoid facing what is actually negative and destructive. Do not blindly apply it to distortions of distortions of distortions and make a game of it. I give you this knowledge to perceive that there is nothing bad in itself except what defense and error create temporarily. QUESTION: What is the positive origin of playing the victim game? ANSWER: The distortion is self-exoneration at the expense of making others guilty, whose victim you profess to be. The truth is the longing for the perfect state you contain in your nucleus, which is not a fixed perfectionism, but the ever moving, changing perfection of the innermost soul. QUESTION: What is behind the defense and compulsion of telling jokes? ANSWER: Life in the universe is joyous, pleasurable, it is light-hearted, it is humor. Humor is a significant divine aspect. There cannot be beauty and love without humor. QUESTION: Competitiveness? Self-centeredness, wanting to be the center of attention? QUESTION: Abuse of power, of a position of authority? ANSWER: Distortion of true leadership. True leadership is taking responsibility, paying the price for leadership. Distortion of it wants the glory of it, the advantages, in a selfish, vain way. QUESTION: I can’t imagine anything positive in the tendency to remove yourself, being “cool,” pretending to be different? ANSWER: The divine original aspect is self-containment, self-sufficiency, impartiality, serenity. In every healthy life there must exist a harmonious balance between sharing intimately with others in a dynamic exchange, and being in solitude so as to refuel from within. They must coexist in utter emotional comfort. When one is lacking, the other must also be lacking, until balance is reestablished. If you are frightened by intimate contact, you will seek seclusion, which will then be something lonely and maudlin, rather than the beautiful version in its original state, which is a time of refueling, a time of going into yourself, of making contact with your inner being, of communing with your inner and outer nature. Then the fruits of this self-containment can be given out again. That would be the right balance. Greetings, my dearest young friends. With great joy do I speak to you this evening. I shall try to give you what you need and to make myself understood. This is not easy, for I usually speak in a very different way from the human language you are accustomed to. So words are not easy to formulate. To explain things is difficult even to adults. But it is particularly difficult when I speak to you. However, I shall try my best. If you do not understand, you can always ask what I mean. And sometimes the understanding will come only much later. This, too, happens to grown-ups. Most grown-ups do not immediately understand what I say, my young friends. They cannot always do that because the inner understanding is blocked. But understanding often comes much later. So be patient. Keep it in reserve, so to speak, if you cannot really comprehend what I say. Now, before answering your questions, I would like to tell you a few things that may be helpful. You are all extremely fortunate in growing up with truth, with understandings that most people do not have. Let me put a few of these basic truths in simple words for you to remember. In the first place, my young friends, if you can believe that much more exists than you can see, you will make room in yourself for a lot of wisdom. And many things that are confusing for people will cease to be confusing to you as you grow a little older. For you must know, adults are as confused as you are. The confusion often arises because you believe only in what you can see and touch and that is a very short-sighted view. The more you can consider the possibility that things you cannot see and touch are often much more real than those you can see and touch, you will gain a new understanding of life. Another thing I would like to tell you to help you is that no injustice exists, even if it seems that way. Do not waste your time in complaining about injustice. If someone else seems to get more than you, wait before making the final judgment that this is so. Allow yourself to consider that there may be things you cannot see, that you may have other things that those whom you envy do not have, and that there is a long chain of circumstances that is as yet invisible to you that makes what appears an injustice quite just. At the same time it is also important to believe that those who seem to have more not only do not have more, but they are not any more lovable or loved than you are. Allow yourself to know that you are very lovable to God. And God is within you. Within every one of you. You may not know this now because you are so busy with your outer mind. But there is something within that you will find, that you will know, that you will hear, and that is the most valuable thing you can find in life. Perhaps these words will be written down for you so that you can remember them. And when you forget them, which will happen again and again, you can always come back to them and remember. That will make a lot of light for you in your life. Now, before answering your questions, my very dearest friends, I would also say to you, I know that this occasion is to bless this place, this room, in which you can experience a lot of joy and fun and also a lot of learning, although this will not necessarily be school learning. You know there is another learning. Let us call it life learning. Life learning is even more important than school learning. Life learning is what the path can teach you. You can apply this as you are together here in this room, where you can have joyful times, but also times of life learning. For example, you older children can gain the freedom you so much wish to have, you so much envy grown-up people for. You can gain more and more of that when you take responsibility. Now this is a word you may not know what to do with. But little by little you can learn what this means. It means looking out for your younger friends and helping them, giving them understanding, instead of hitting back when they seem to do something that angers you. You can try to put yourself in the place of the younger ones and in that way you can take responsibility. You can be patient rather than impatient. That is taking responsibility. You can give rather than demand, and that is taking responsibility. And then there is yet another way of taking responsibility. Instead of saying, “You are wrong and I am right,” “You are bad and I am good,” which you seem to say many times when you have misunderstandings and when you quarrel, you can question: “Maybe there is something in me that is not so right.” That is taking responsibility. And you can both look together for what is right and what is not so right in each of you. By doing that you create a wonderful thing. You take responsibility. And this responsibility will give you privileges and freedom that you will very much enjoy. Study these words and think about them and put them little by little into action. And if others do not seem to love and appreciate you, that is not necessarily the truth. A harsh word does not mean you are not loved. The important thing is that you know you are lovable even if you are naughty, even if you are sometimes wrong. And you must be wrong sometimes, for all human beings are, and you are human beings too, are you not? Now, my friends, I am ready for your questions. QUESTION: I find it very difficult to relate to people my own age. I can relate to older or younger people, but never to my own age. ANSWER: Yes. This is mostly because you are afraid, and because you are afraid you set up a wall between you and them. You make yourself critical of them and then you must feel that they are critical of you. In your mind they seem to have power over you, because they can criticize you, they can reject you, and in that way you see them as much more powerful than you see yourself. And in reality those others may be just as afraid of your judgment and your criticalness as you are of theirs. And they endow you with as much power as you endow them with power in your own mind. Now perhaps you can begin to question. First of all, you have to be aware of how afraid you are of their judgments. Are you aware of that? QUESTION: I think so, but I’m not sure. ANSWER: Now maybe you can set out to observe yourself more closely in this respect, and as you see your fear of their judgment, you can go to the next step and see how you judge them. Are you aware of judging others? ANSWER: Well, that is the measure of your fear. And perhaps you can begin to see your peer group as being just as afraid and unsure as you are. They may respond to a kind word as you might respond to a kind word. In doing so you will eliminate the fear that separates you. QUESTION: Well, I’m really afraid that my father’s going to object to my name being changed to Solomon. I’m really scared that he is going to say no. ANSWER: Well, my dearest friend D., I say to you, you need not fear anything. Whether your name will be changed or not, you need not fear. You are safe and secure, and this does not depend on the name. It is very, very probable that sooner or later the name will be changed. But you put too much importance on that. Perhaps in your private sessions you can see what a lot of your fears really are, and they have nothing to do with the name. Can you understand what I’m saying? ANSWER: It is very important that you see that your fears are illusions. But in order to really believe that your fears are illusions and you do not have to fear anything, that you are protected and guided and loved, you have to see what these fears are and work them through with your helper. If you like to, you can even work in an adult group with the help of the adult friends you have here. For they are your friends and they can help you. And it depends on you whether you accept that help or not. You, all my younger friends, have the right to ask for help. Do not set a wall between you and the grown-up world. There is no wall unless you make one. And then with that help you can lose your fears more and more. Do you understand that? QUESTION: Well, I worry a lot, mostly about problems I don’t even have to worry about. And I’d like your help to get over this problem. ANSWER: Yes. Well, your worrying about problems that are not problems is perhaps also a way for you, similar to D., that you look away from what you really feel and what really disturbs you and then you create something else instead. So I say to you too, with the help that you have, you can truly find what your real fears are. These fears are all a result of something you misunderstand somewhere. All adults have such misunderstandings. Again, this is not peculiarly so because you are children. Some of you children are very, very developed spirits. But you still have misunderstandings. You have been helped in this lifetime and guided to this particular path in your very young years so that you can free yourself of the fears—fears that come only from misunderstandings. Maybe you can always remember that your fears are misunderstandings, false beliefs. And you, too, can ask your adult friends to help you find what the misunderstandings are. With their help you can find out that you do not need to fear something that is painful, or something that is at the moment not the way you want it. It is not bad when that happens. Often you think it is bad. But it is not really bad. Do you understand? QUESTION: I think so. Thank you. QUESTION: Sometimes I feel very sloppy, and I want everything to be very messy, like things thrown around where I live. And sometimes I feel like I want everything to be very nice. Why do I want things to be sloppy and messy? ANSWER: Well, I would say perhaps because you are angry and do not know that you are angry. Is that possible? Maybe it would be very helpful for you if you feel you want to be disorderly, sloppy as you say, to ask yourself, “Am I angry? What am I angry about?” It is so much better to know what you really feel than to not know what you feel. Then it comes about and around in a different way and then you become confused. It is very important to avoid this confusion and the pathwork can help you to avoid such confusion by teaching you to know when you are angry. Perhaps I can say a few words to all of you about anger. So much of the anger you have, and therefore also of the fear, is because you do not always get what you want right away. Now it is very important, for your happiness and your contentment, and for your living without fear, that you understand exactly what I mean by this. Not having what you want is not a terrible thing. You can perhaps allow in your mind that it is okay not to get what you want. Maybe you can tell yourself that, yes, it would be nice to have it now, but maybe I can have what I want in a different way, at a different time. The only way you can truly be free is if you do not insist on other things and other people in the same fearful way you do now. You can really learn that, even while you are as young as you are. You can begin to learn that you can question the necessity to have it right now, even though having it might be pleasant. And you can perhaps also have the faith that the loving God in you wants you to be happy and will make you happy if you learn these lessons and stop thinking that you will not be happy if you do not have it every way you want it, immediately. So much of your anger and much of your fear is because of that misunderstanding, that you think you cannot be happy unless you have your way at once. Your disorderliness or your desire to be disorderly is because you are angry. And you are angry because you do not always get your way. Do you see that? QUESTION: A lot of times you said that such and such is childish. I want to know what you mean by that. ANSWER: Let us make a distinction between childish and childlike. Childlike is beautiful, and no adult can be truly joyful and creative and happy unless they preserve also their childlikeness. Childlikeness means the capacity to be joyous and adventurous and to find out the excitement of new things, to be fresh and to question and to learn and not to have a set mind in which one thinks one knows everything. That is being childlike and that is an invaluable quality that you should truly nurture in you. By childish I mean immature. Immaturity is the misunderstanding, the ignorance of the very young who have to learn and see what life is all about. It is perhaps the quality I just described, the inability to accept frustration, which is childish or immature. It is the false belief that if you do not have what you want immediately, you will perish, or something very bad will happen, or you can never be happy again. That is childish. So is the inability to take discipline. That is childish in the sense that a person who is unable to take discipline is governed by a false understanding, and this is very different from the childlike quality that is so valuable. Do you see what I mean? QUESTION: I want to know, when I grow up will there still be a Center? I’m really worried about it. ANSWER: There will always be a center. That center is primarily within you and then you will always find the outer center. But this particular Center will indeed be much more than it is now. For this is only a beginning. And it will become more and more beautiful, more and more alive, more and more joyous, as all of you make this Center grow, including you, my younger friends, who will, when you grow up, be the center of, the responsible people of, this Center. QUESTION: I’d like to ask if you could help me understand why I’m so afraid of being considered a child. ANSWER: Maybe you are afraid because you think it is bad or inferior or dumb to be a child. But that is not so at all. Is it possible that you are afraid of that? And that you also believe that as a child you are helpless, that you are dependent, and you do not trust some of the grownups to depend on? All that may be part of it. And maybe you can pray inside of you that you can trust that God in you will guide you right. And you do not have to fear any age because whatever the age is, it is right and good. Every age has its own particular beauty and advantage. QUESTION: (an adult question): So many children are afraid of things like monsters coming out of the closet at night. Could you perhaps help with this? ANSWER: I would like to answer this in the following way. Perhaps there are two parts to this answer. If you are very excited by monsters and there is an excitement and interest in them, like reading about them, then you will also create a fear of them. And the other part of the answer is: Perhaps if you are very angry and you have hate in you and you think you are so bad because you hate, then you create the idea of a monster. And if you can really say, “Yes, I hate and it is due to a misunderstanding, and I will work that through, I will work with my hate,” then the fear of monsters will go away. You will not be so fascinated by these spooky things. And now I would like to say to all of you, my younger friends, that this is a very meaningful meeting. And whenever you want it, you can have another session with me. You can ask more questions and ask me for help, either in the form of a session particularly for you, or when you come to general sessions, which are as much for you as for the grownups. You have as much right to this help as anyone else. I want you to know that.